ORAU Survey Projects Manager Erika Bailey knows the independent verification process inside and out and the survey management approach from top to bottom. But that wasn’t always the case. When she began her career, she started out on the first rung of the industry ladder. 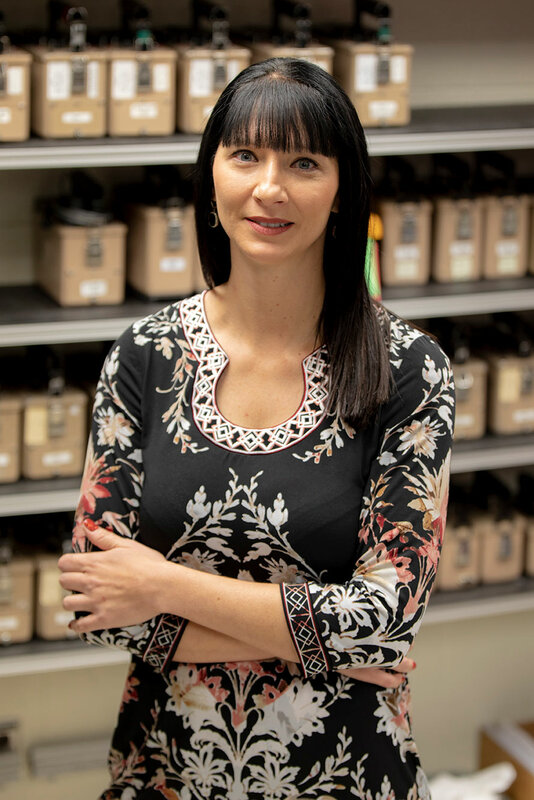 Bailey started at ORAU 14 years ago as a health physics technician for environmental assessment projects, packing and calibrating the instruments required for environmental surveys. Today, she manages a team of more than a dozen people while spending half of her time in the field with boots on the ground and the other half managing the detailed logistical planning that goes into every environmental assessment project. Bailey says she “tripped” into the health physics field not long after graduating from college. “People always asked me what I wanted to do, and the response was always the same: I would like to be able to travel, and I don’t want to be sitting in an office all the time. I wanted to be in the field gathering data, performing assessments,” she explained. When Bailey stumbled across her first health physics position, she wasn’t quite sure what the job would entail. Before long, she realized working in health physics involved everything she hoped for. With a background in environmental science and eventually earning a master’s degree in nuclear engineering, Bailey utilizes her knowledge and skills from both fields in the health physics industry. “The environmental science degree was great because that’s what we do in health physics. We perform environmental assessments by going to properties and determining what contamination is there and at what levels. A mentor convinced me to get a nuclear engineering degree because anything in health physics involves nuclear processes. And it all came together at ORAU,” Bailey said. Since then, she has traveled the world completing environmental assessment projects for the Department of Energy, the Nuclear Regulatory Commission and customers such as the Navy and other support branches to the military. One of her favorite assignments has been surveying ships that were contaminated during the Fukushima Daiichi nuclear plant meltdown in Japan following a massive earthquake and tsunami. In addition to leading the way on decommissioning projects, Bailey has been instrumental in helping ORAU stay on the forefront of industry technology and procedures. Her team practices consistent, in-depth data logging, capturing every measurement collected and producing histograms and graphs with the results. “I’m most proud that we stay on the forefront, and we present our data in the best way that we can so there’s no question of accuracy or credibility,” Bailey said. ORAU has performed independent verification through proven survey processes and developed planning procedures for more than 35 years, which reinforces her team’s credibility and expertise. “Before we even get on site, we’ve planned our surveys and our data collection methods. Even if the results are not what the customer wants to hear, we always tell them what we find. We don’t take shortcuts. We always do the right thing, and that’s why we are trusted,” she said. As ORAU continues to refine and improve survey practices, an influx of work in the next decade is expected to put a strain on the health physics industry as a whole. The Nuclear Regulatory Commission is in the process of decommissioning nuclear reactors across the country, and eventually they will all have to undergo decontamination. Bailey’s team is currently working on three reactors and anticipates more in the very future—and she’s anything but worried about the future success of her team. “We have such high-level technical people here, and we work really well together. Between all of us, we can work through anything. We’re innovative because we have people that really understand the instrumentation, the electronics and how they work, so we can modify for our needs on the fly,” Bailey said. Bailey looks forward to more traveling, professional growth and new independent verification projects in her career. But, whenever her team needs an extra hand, she can still be found with the floor scanners and Geiger counters or packing and calibrating the instruments for ORAU’s next environmental survey. Our experts customize decontamination and decommissioning surveys to achieve high-quality, defensible data and ensure efficient and cost-effective cleanup. With high quality standards, ORAU survey results instill trust and confidence that public health and safety is protected following your site’s cleanup. ORAU independently develops and implements radiological and chemical characterization survey plans for state and government agencies, as well as private sector organizations. The plans developed ensure the collection and assessment of the appropriate data quantity and quality necessary for confident decision making and controlling project scope uncertainties. Our exeperienced health physicists and survey technicians use nondestructive assay (NDA) techniques and portable instrumentation to provide on-site analyses without physically altering contaminated equipment or compromising site safety. ORAU provides final status survey services designed to satisfy site-specific data quality and data assessment objectives. Radiological surface scans, measurement and sample data collected by our health physics experts are used to confirm that all release criteria conditions have been satisfied, and that potential risks from residual contamination and small areas of elevated activity are below the derived concentration guideline levels. In our efforts to support customers throughout the decontamination and decommissioning process, ORAU's independent team of health physicists provides assurance that remediation was effective and that all final status survey requirements have been accomplished and documented. The resulting data from verification helps to clearly demonstrate that all property release guidelines and criteria have been satisfied. When the safety of your workers and the public is at stake, accurate and reliable health physics expertise is necessary to demonstrate compliance with federal and/or state regulations and guidelines regarding radiological exposure. ORAU’s highly-qualified health physicists perform site-specific radiation dose and risk assessments, using methods consistent with industry standards, to meet these regulatory requirements. As a part of NOAA’s Air Resources Laboratory, ORAU’s atmospheric scientists at ATDD provide engineering expertise on the development and deployment of instrumentation and data analysis for short intensive campaigns to multi-decade, nationwide climate monitoring stations and systems. For more information about ORAU's environmental assessment services, contact Sarah Roberts at 865.241.8893 or sarah.roberts@orau.org. For more information about contracting with ORAU, contact Kathy Rollow at 865.574.4390 or kathy.rollow@orau.org.